Why should humans get all the tasty fall desserts? 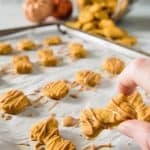 Treat your pup to these Soft Baked Peanut Butter Pumpkin homemade dog treats and let 'em revel in the season with you! Preheat oven to 325 degrees F. Line 2 baking sheets with parchment paper. Set aside. In a large bowl, combine pumpkin, peanut butter, broth/milk, and egg. Mix well. Add 2 cups of flour and baking powder and, using a rubber spatula, mix until combined. Stir in oats. Continue to add flour 1/4 cup at a time until dough is no longer sticky, kneading on a floured table top if necessary to incorporate flour. Turn dough on to a table and use a rolling pin to roll dough to 1/4-inch thickness. Use cookie cutters to create shaped cookies or a pizza cutter to create squares or logs. Re-roll scraps until all of the dough has been used. Place cookies on prepared baking sheets. Bake for 8-12 minutes (depending on size,) then use a spatula to flip cookies. Bake for an additional 7-13 minutes, adding more time for crunchier cookies. Remove from oven and drizzle with some warmed peanut butter if desired. Cool the cookies completely before treating your dog! Store treats in an airtight container for up to 1 week.